Thanks to GG&T Land & Cattle of Quinter, KS for purchasing SELENA for $2900 as the second high-selling female of the 2007 Salers Supreme Sale. SELENA is a high-volume, thick-made, attractive and feminine daughter of NAVIGATOR who is distinguished by her easy-fleshing type, flawless structure and gentle disposition. She generated a generous amount of interest at the 2007 Junior National where she stood second in class to the Reserve Champion female. Her dam consistently combines light birth weights with solid productivity, posting an average birth weight of 79 pounds along with an average weaning ratio of 101 on 3 calves. Typical of the NAVIGATOR progeny, SELENA ultrasounded well, posting an IMF ratio of 108. 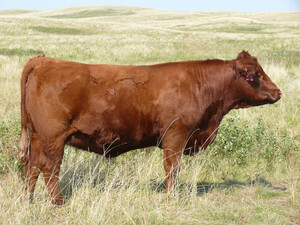 SELENA sells AI bred to the great young sire, BIG SKY TRITON 40R. The NAVIGATOR daughters are doing a spectacular job as producing females and this is a chance to own one of the top NAVIGATOR daughters to be produced in our herd.